For my daughter’s first birthday party, I decided to make a drum cake…then thought about it some more…and then decided to also make a xylophone cake, the night before. Not to toot my own horn, the cakes I drummed up were instrumental in amping up her birthday celebration! The drum cake turned out okay, but I think it didn’t have that “pop” factor because of the pastel colors I chose. I think I’ll use brighter colors next time. The xylophone cake, which was decided last minute, actually turned out better, I thought. I made sugar cookies for the keys and the wheels. I simply colored in the keys and wheels with colored royal icing. I dotted the center of the outermost keys with a small dollop of frosting and put a brown M&M on top. My daughter must have thought it was the real thing because as we were singing happy birthday to her, she kept pounding the keys with a little drumstick! 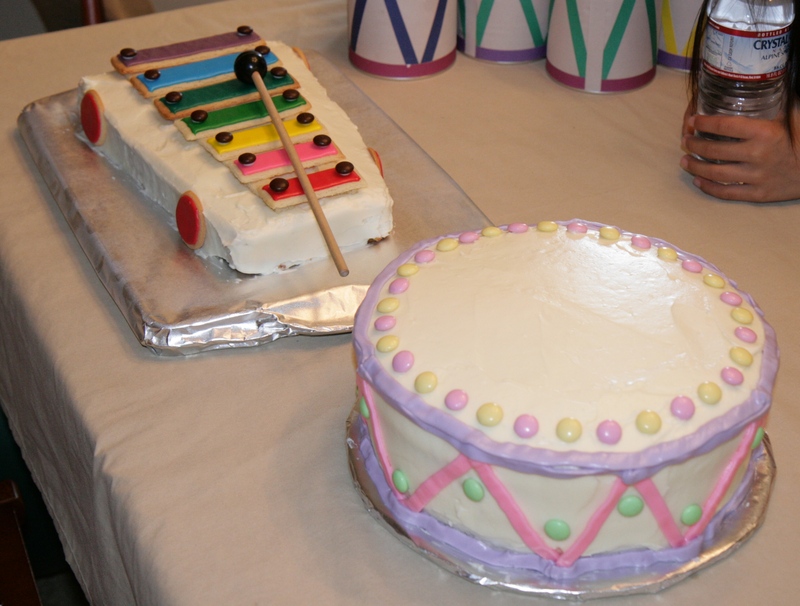 The drum cake was a lemon cake with raspberry-lemon curd filling and the xylophone cake was a banana-pineapple cake. I used cream cheese frosting for both cakes and I was very pleased that we had no leftovers!